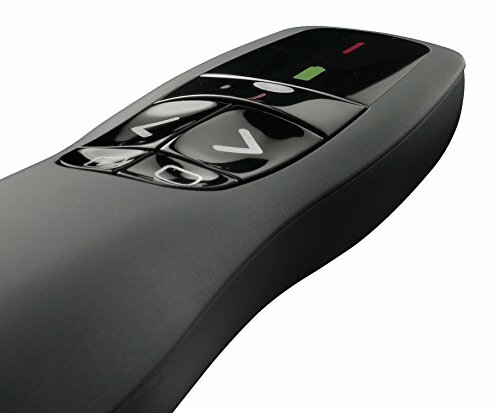 The Logitech wireless presenter R400, with a Red laser Pointer, is designed to help you make your point in a smaller meeting room setting, and is easy to see against most backgrounds and projection surfaces. A battery power indicator ensures you always have the power you need to finish your presentation, while a range of up to 50 feet (15 meters) lets you move around the room for more engagement with your audience. The intuitive Slideshow controls help you find buttons easily by touch, and the compact design allows you to take it with you wherever you go. Plus the contoured shape feels great in your hand, so you'll be comfortable no matter how long the presentation lasts.